Email subject lines can be tricky. Let’s imagine you spend hours writing an email that you’re proud of – an email you think may help you surpass your goals. You wait at your computer trying to focus on other work while you keep thinking about that email. Finally, you can’t wait any longer and you check out your email analytics. And the worst thing happens: Your open rate is low. This exact scenario has happened to me. It’s a big letdown, and it has an impact. After all, your subject line is the main factor in determining whether an email is opened or ignored. To save you from bad open rates, I’ve collected the subject lines from our most opened emails and analyzed them to see why they work. In this post, I’ll share what I found. Similar to seeing a dog walk on two legs, great subject lines grab your audience’s attention. The best ones stop your subscribers mid-scroll as they’re sorting through emails in their inbox. One way to write subject lines like this is to surprise your audience by taking a perspective or stance they don’t expect you to hold. Since we are an email marketing platform, our audience was most likely surprised by us saying the email blast is dead. When they saw this subject line in their inbox, they probably wanted to learn why we took this stance and clicked the email to find out. Another way you can use this tactic is to surprise your audience by challenging their commonly held beliefs about your industry. For example, many businesses feel they need a huge email list to see success with email marketing. To challenge this idea, we wrote a blog post explaining why you don’t need a huge email list. This subject line gave us a high open rate, and because the content featured the blog post, we also got a high click-through rate. However, when using this tactic, take care to only say something unexpected if it’s a belief or idea that you can defend and truly believe in. Click-bait subject lines will likely annoy your audience and cause you to lose their trust. You may have tried asking a question in your subject line before. Maybe you saw great results. Maybe so-so results. Through our own research, we’ve found that questions can be extremely effective subject lines – but only certain kinds of questions. For us, the highest-performing subject lines are ones that ask a question we know our audience is actually asking. When we ask questions our audience isn’t asking, our open rates aren’t as good. For example, a few days before Labor Day, we conducted a subject line split test. We created two identical emails and then gave them different subject lines. The first subject line asked a question. The second subject line made a statement. Version A: Yes, there’s still time to send a Labor Day email! Version B: Waiting till the last minute to send a Labor Day email? The results? The exact same open rate. Yep. There was absolutely no difference in open rate for these two subject lines. Weird, huh? So we did more testing. For our next question subject line, we used survey data from our audience to understand what questions our audience was actually looking for answers to. We found that quite a few people wanted to know how often and when to send emails. This subject line scored an open rate that was 26 percent higher than our average for that list. By asking a question we knew our audience was interested in, we were able to increase opens. Have you heard about social proof? It’s a copywriting and persuasion tactic where a person becomes interested in something because other people endorsed it or liked it. Knowing that social proof can be super effective, we decided to test it out in a subject line. For our “Ask Me About Email Marketing” podcast, we interviewed growth expert and Sumo Founder Noah Kagan. The episode ended up being our most downloaded episode at the time, so we decided to leverage herd social proof by titling the blog post The Most Downloaded Episode of All-time with Noah Kagan. To further that impact, we used a variation of the post title for the subject line of our weekly newsletter promoting the podcast episode. This subject line had an open rate 13% higher than our average. Showing that the episode was popular with lots of people gave us a high open rate and consequently, brought more traffic to our blog. Another effective ways to increase open rates is to make your subscribers curious about the content inside of an email. By piquing their curiosity, you can encourage them to open your email. You can do this by hinting at the topic of your email in the subject line. Or, you can explain to subscribers that they can get full details about a certain topic if they open your email. For example, we used a common audience question about email send frequency as a question in a subject line. Then, to build curiosity, we put a statement at the end of the subject line saying they could find the answer to their question inside the email. The subject line was: How many emails should you send? The answer is inside. We got an open rate 6% higher than our average with this subject line. We often use subject lines like these to build curiosity, and they frequently lead to great open rates. I promise. I know how to spell. The lede is a journalism term for the most important part of a story or piece of news. While journalists live by the concept of leading with the lede, it’s relevant for anyone who writes and can be extremely effective for boosting your open rates. While you can instill curiosity with a subject line that hints at the content of your email, you can also get a high open rate by telling a person the most important or interesting information in the subject line. How can you determine what the most important information is? Ask yourself: What is the one thing I want subscribers to know after reading this email? Or: What is the most surprising part of this email? Many of these subject lines got open rates above 70 percent, and we’ve even attained open rates over 90 percent using this format. You’ve got subject lines down. Try emails. Now that you have proven subject line formulas to boost your email open rates, it’s time to focus on improving your email content. We’ve created an entire email course to help you do that – and it’s free! 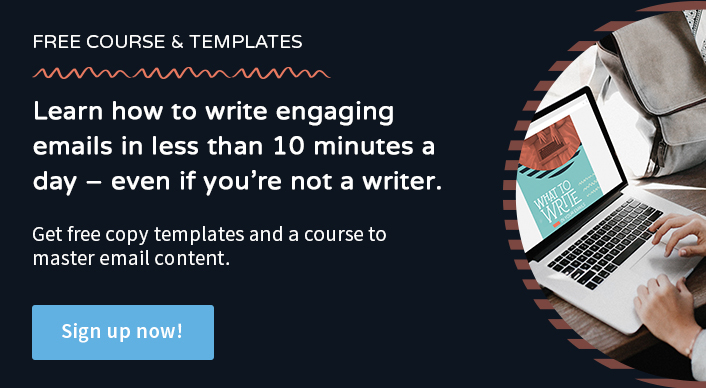 Plus, you’ll also get more than 45 fill-in-the-blank email templates to make writing as simple as copy, paste and send. You can sign up here.